Cuker’s recent website for OluKai has been awarded a 2014 Summit Creative Award (SCA), an award that recognizes creative excellence in advertising and marketing companies. The SCA’s are one of three prestigious competitions administered annually by the Summit International Awards (SIA). Cuker designed and developed OluKai.com with a mobile-first responsive design approach. The site features a simplified shopping experience where users can easily browse the premium footwear, view product detail pages, and purchase directly from their smartphones or tablets. Along with a unified brand message and beautiful imagery, the site delivers an enhanced user experience. 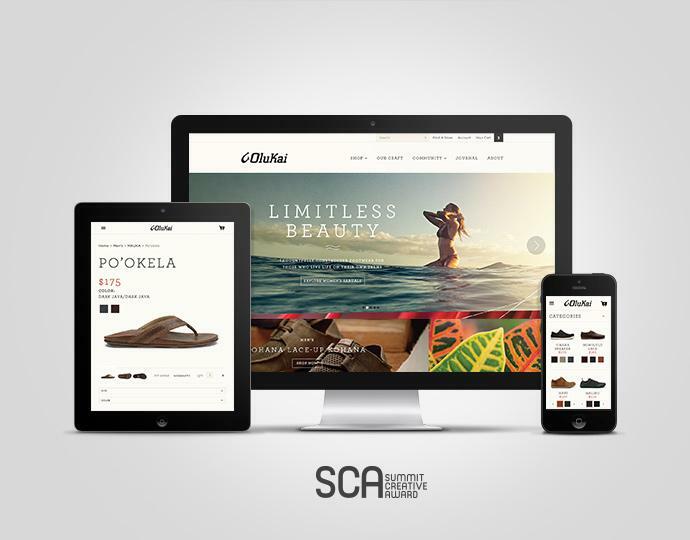 OluKai’s website was awarded a Silver Summit Creative Award in the eCommerce Website category. Cuker was also recently recognized by the SCA’s for their work with Royal Hawaiian. About The Summit International Awards The Summit International Awards (SIA) organization is dedicated to furthering excellence in the marketing communications industry. It administers three distinguished advertising and marketing award competitions throughout the year with the goal of raising the awareness of companies and individuals who have the creative and marketing talent to go beyond the ordinary. To learn more, please visit www.summitawards.com.